What does a one-week road trip around Ireland cost? One week, a hire car, a GPS unit and two budget-conscious travellers…..in Ireland. There’s something wrong with this picture, and that lies with the fact that driving 1600kms around Ireland is not cheap. At all. But I’m not just trying to make myself feel better when I say that it was completely worth it. Car hire for 7 days = A total of €130 through carhire3000.com. 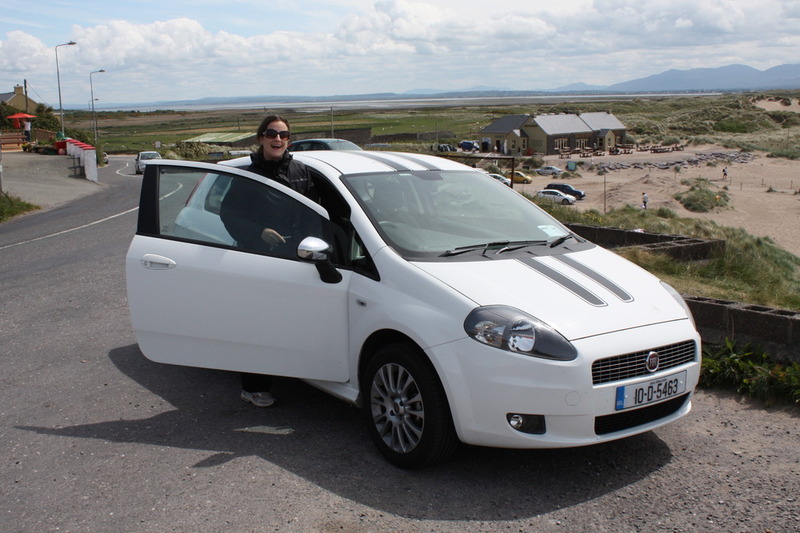 We ended up with a 2010 Fiat Punto from Thrifty which wasn’t at all bad and even had racing stripes! That’s a grand total of €82.60 per day per person, twin share. Naturally, you could do it cheaper by sharing the transport costs with a larger group, by staying in hostels and not having a propensity for purchasing photography and art. However, when staying at B&B’s you don’t need to buy lunch everyday because most of the time the Irish breakfast will see you through until dinner. We covered a fair distance in the 7 days but despite Ireland’s manageable size we ran out of time to make it to Northern Ireland, which will be on top of the list for our next trip to the green pastures of Eire. I’m sorry, I don’t remember the exact location but I believe it was on the Dingle Peninsula.